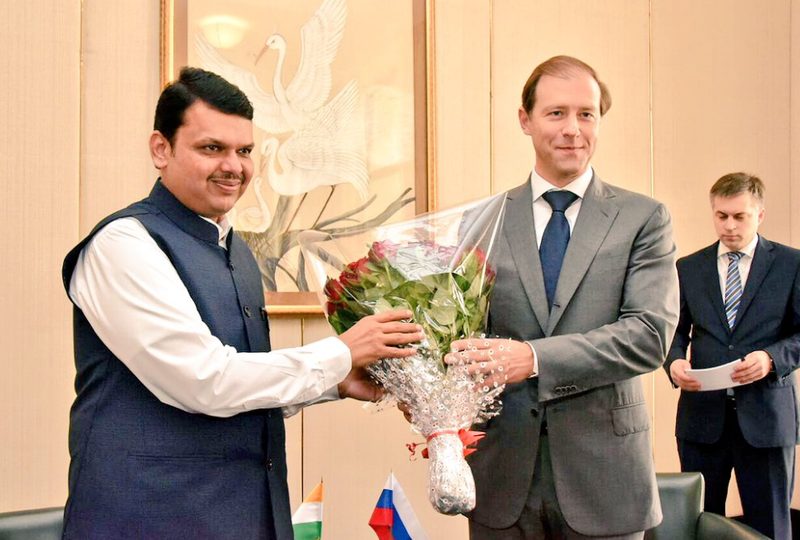 Denis Manturov and Devendra Fadnavis, Chief Minister of Maharashtra. During his visit to India ahead of the BRICS summit in Goa, Russian Trade Minister Denis Manturov visited the states of Rajasthan, Andhra Pradesh and Maharashtra to discuss various investment opportunities across sectors. Denis Manturov, Russia’s Minister of Trade and Industry has, during his three-day tour across Indian states, explored the potential of Rajasthan, Andhra Pradesh and Maharashtra for the Russian government and for private businesses across sectors. In Andhra Pradesh (A.P. ), two Russian companies; United Shipbuilding Corporation (USC) and TechnoNICOL Corporation – signed Memorandums of Understanding with the A.P. Economic Development Board (AP-EDB). While USC is looking to cooperate with the state to establish shipbuilding facilities and develop infrastructure for other shipbuilding projects, TechnoNICOL Corporation and its Indian partner SUN Group are looking at creating a cluster for waterproofing, roofing and insulation products manufacturing in A.P. The investments in the latter project could reach $60 million. Manturov said partnerships forged by Russia and A.P. provide the much-needed impetus to their economic and commercial engagement and should usher in new era in development and pave the way for Indo-Russian economic and industrial cooperation. During his visit to Rajasthan, Manturov met chief minister Vasundhara Raje and discussed various areas of cooperation in infrastructure, mining, urban development, pollution control, defence manufacturing, heavy machinery and engineering. As Rajasthan has emerged as one of the largest centres for mining, engineering and automotive industries, it could become the next investment destination for Russian heavy industry, Raje noted. At his meeting with Nirmala Sitharaman, Indian Minister of State for Commerce and Industry, Manturov discussed potential investment projects in civil aviation. Russia and India have been cooperating in defence aircraft manufacturing since the 1970s. Speaking to reporters on the sidelines of the BRICS Business Forum, Manturov said Russia and India were set to go beyond defence aviation and are now in talks for co-production of Kamov-226 helicopters and Ilyushin Il-114 passenger aircrafts in India. The Indian and Russian trade ministers also discussed mutual projects in the mining industry. According to Manturov, a new investment project for development of gold deposits in the Russian Kluchevsk in the Chita region was discussed during the ministerial meeting of five BRICS countries’ trade ministers in New Delhi, which has attracted investors from each country. India’s SUN Gold Ltd, China National Gold Group Corporation, OJSC ‘Far East and Baikal Region Development Fund’ and private investors from South Africa and Brazil, Transafrica Capital and Vox Capital have reached an initial understanding on participation in this project that could be a significant incentive for the industrial development in the Russian far East. Mantrurov also said Russian Railways are currently in talks with India for participation in the Delhi-Mumbai Industrial Corridor Project, one of the most ambitious and costliest infrastructure projects in India at the moment. “Our colleagues from Russian Railways will hold discussions on the possibilities of their participation in the Delhi Mumbai corridor project. We hope that our colleagues from India will show interest and will make a choice in favour of our company. This way Russian Railways could be a driving force for machinery manufacturers in Russia who could actively participate in supplying rolling stock and locomotives for this project,” Manturov said. According to sources in Russian Railways, no actual deals have been signed yet. However, a few projects could be officially announced during the BRICS summit in Goa.